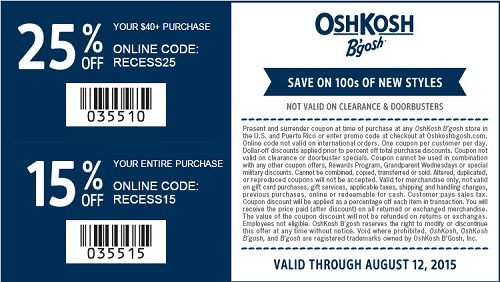 Save with a sale coupon at U.S. OshKosh B'gosh stores. Print the coupon, visit your nearest OshKosh B'gosh store in the U.S. and enjoy this offer: rake 25% off your $40+ purchase, or take 15% off your entire purchase. Offer is also valid online with promo codes: RECESS25 (to receive 25% discount) or RECESS15 (to receive 15% discount). Source of the information is OshKosh B'gosh. More information about the offer available at OshKosh B'gosh stores or online. Offer is valid through 08/12/2015.